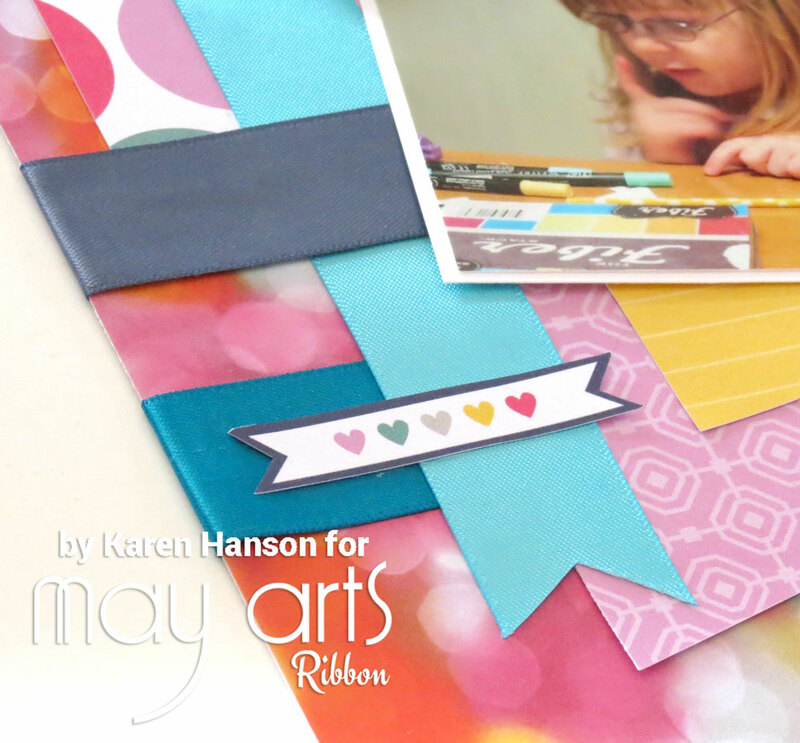 It is new release time at May Arts Ribbon, and the design team has been working hard (I know, it’s tough working with pretty ribbon) to share some project ideas featuring all the new ribbons and trim! If you have spent any time here at SCS, you will know that I love colour!! So, when I saw the new 7/8″ Double Faced Satin collection, I begged the Ribbon Lady to let me play!! If you haven’t seen this collection yet, it features 7 colours in the blue/green/teal family, and is available in the 3/8″, 7/8” and 1.5″ widths. F or this little “Thinking of You Card” ( 4 1/4″x 5 1/2″), I simply created 1.5″ strips of the ribbon, cut the bottom edge into a v-shape, and then layered on row on top to the other – alternating the colours. I thought the colour family was so pretty that I let it define my paper choices too – a set that comes out of DCWV’s Chick Chat stack. Since I loved how fresh and vibrant these colours were together, I also decided to create a couple of hair bows for my fresh and vibrant little gals! These are just screaming to top off a couple of pigtails, don’t you think? I also thought it would be fun to see how these ribbons worked with some other colour schemes too! This wa a layout I created to celebrate a little crafter in my life! I love that the ribbons worked together to pull some of the colours out of the paper and create a bit more contrast. I did a bit of layering for interest, and simply tacked the ribbon down with some adhesive from my ATG gun. Okay, while I will admit that blues and greens are not my usual “go to” colours (pink, pink and more pink), I really love this collection!!! I have no doubt that it will be a big part of my crafting this spring (I see a whole collection of spring and Easter projects in the future). Karen Hanson <— You are here! This entry was posted in Cards, General crafts, Scrapbooking and tagged bows, May Arts, new release, ombre, ribbon, satin by Scrappy Canuck. Bookmark the permalink. 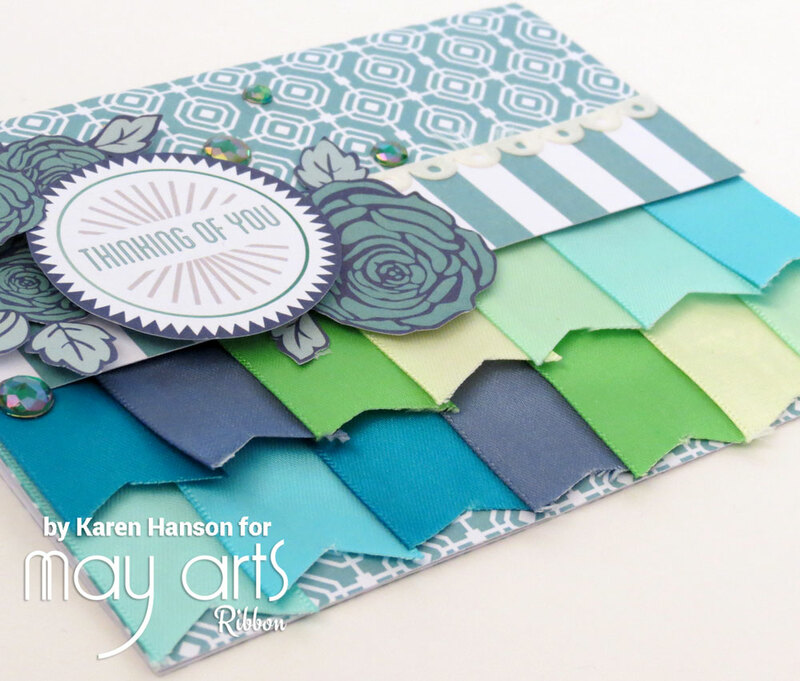 Wow, love your card and all those dreamy colors! Great design idea! Great projects, love this 7/8″ Double Faced Satin collection, the colors go so good with the LO. TFS. Love blue so I was happy to see these. Great idea to make two rows of fishtails on the card. Sweet ideas! 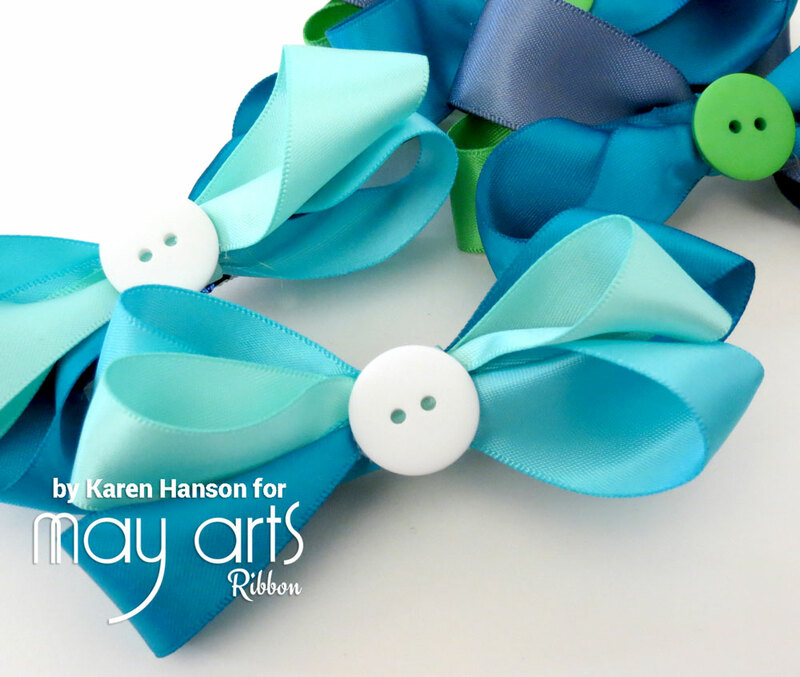 What cute hair bows and I love the idea of ribbon rows across a card… a great way to use scraps! Love these blues and greens and how you used them. So many fabulous projects!! You are so talented and busy!!! Love all of them especially the layout! BEAUTIFUL colours and FABULOUS projects Karen!!! WOW – you have been ULTRA CREATIVE with these ribbons, LOVE the layered strips on your card, LOVE your SUPER CUTE hair bows and LOVE how PERFECTLY the ribbons & design of your layout work together with the ADORABLE photos of your layout!!! both projects are so beautiful, but your card is awesome, was my favorite! 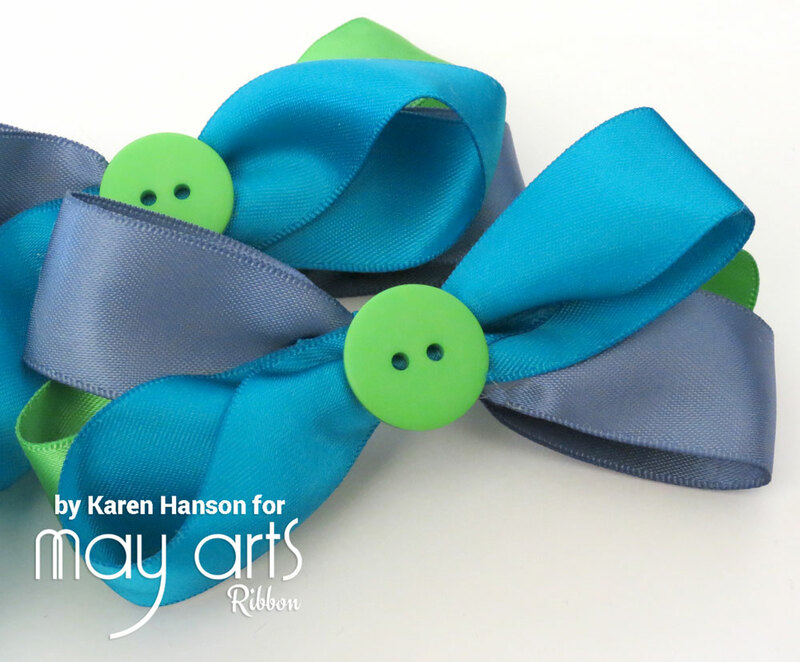 Your ribbon colors matched your card stock beautifully Karen. Those little hair bows are sweet. Thanks for sharing.